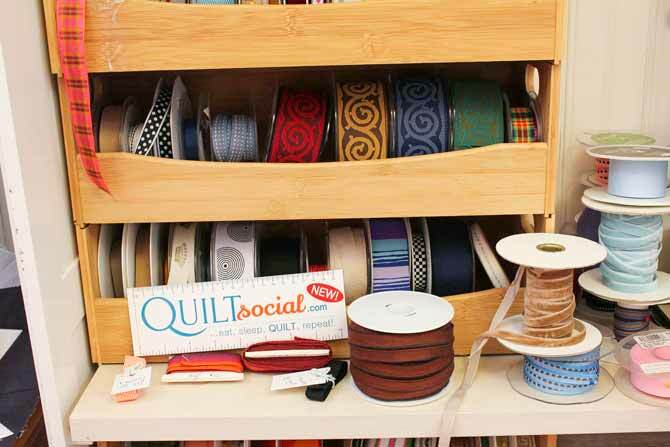 Home » QUILTsocial » 50 ways to keep a quilter happy while on vacation 3, 2, 1! 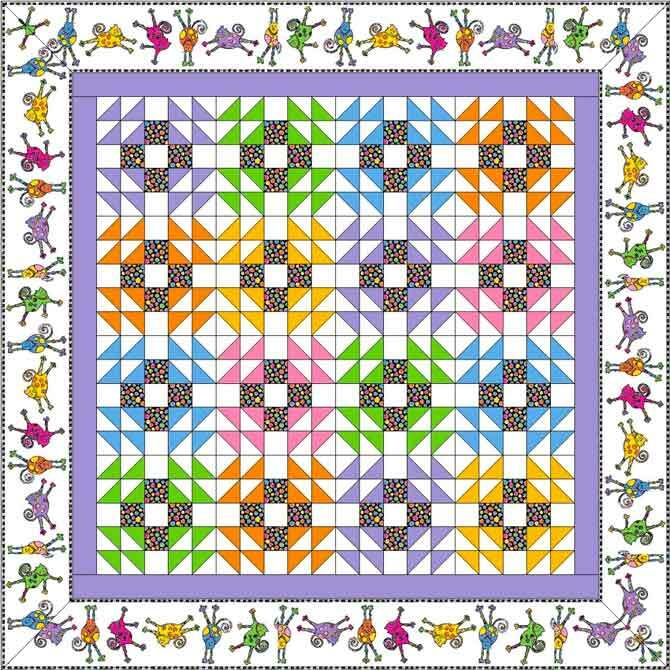 Today is the LAST post in this series of 50 ways to keep a quilter happy while on vacation. I hope you enjoyed reading them as much as I had in researching and writing them. I’ve seen a lot of country, visited some great shops, seen some amazing talent and it’s been loads of fun. I still have some great ideas, but I had to choose two final ones for today and we make one last stop in a quilt store. Enjoy! Let’s face it – you brought your lap top to the cottage so you could stay connected. 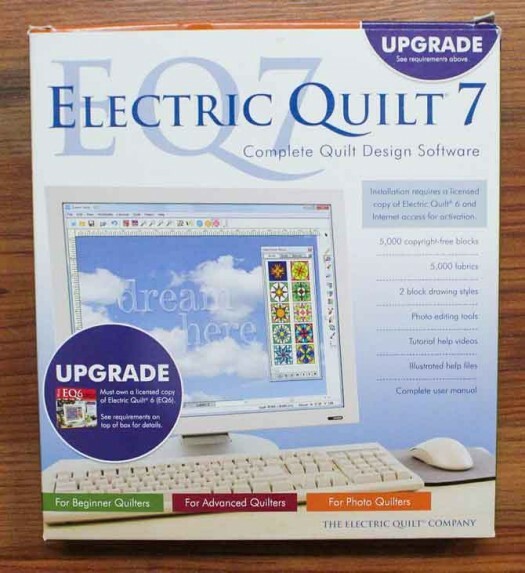 You bought Electric Quilt years ago to design quilts and you haven’t touched it – right? Being on vacation is a perfect time to play around with this software. While I’ve been a user of Electric Quilt software for many years, I’ve just touched the surface of its capabilities. I now have an opportunity to learn it better and I’m loving it! I’m becoming the queen of virtual fussy cutting. 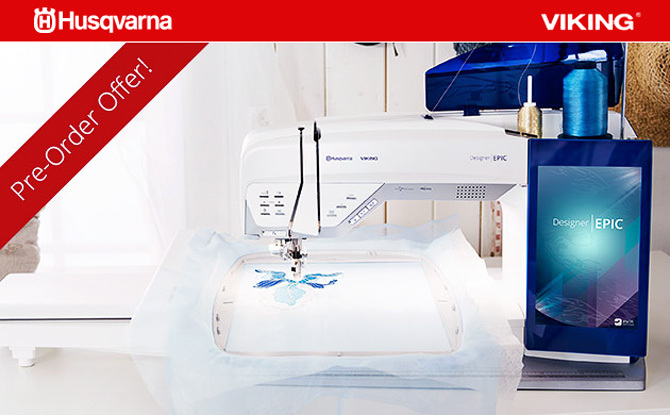 Fall is coming and that means new sewing machines are going to be released! If you’re in the market for a new sewing machine, you can always check out the reviews posted on QUILTsocial. I’ve had a blast reviewing the Husqvarna Viking Sapphire 930. What a versatile sewing machine and the free motion quilting has been marvelously easy to work with. However if you want something really hot off the press, check out the new Husqvarna Viking Designer Epic which will be hitting stores in October. Sounds like a fabulous sewing machine. One can never have too many sewing machines. 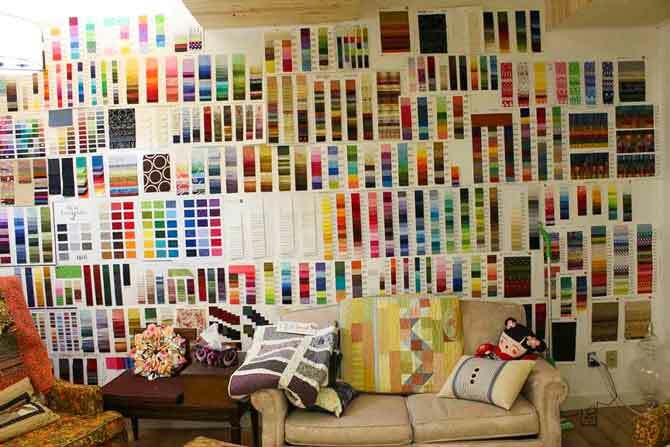 One for the studio, one for work, one for the cottage, one for piecing, one for quilting – you know what I mean! Tell your family how much time you’ll save by not having to switch between piecing and quilting on your existing machine! 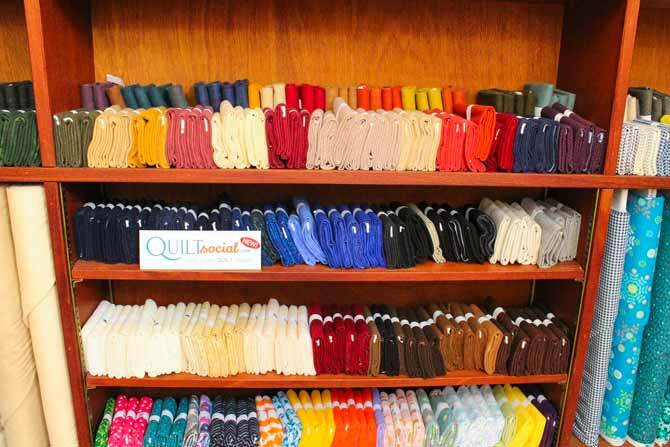 Periwinkle Quilts is located in Saskatoon and offers a very wide array of fabrics, patterns and other goodies. They had some really unique ideas in the store which I’m sharing with you. While Periwinkle had great fabrics and notions, there were two things that I just loved about this store. The owner writes a blog for the store. Her mother isn’t comfortable with reading the blog on-line and wants to keep up with what her daughter wrote, so the blogs were published into books. What a great idea! Hmmmmm – that gives me an idea! 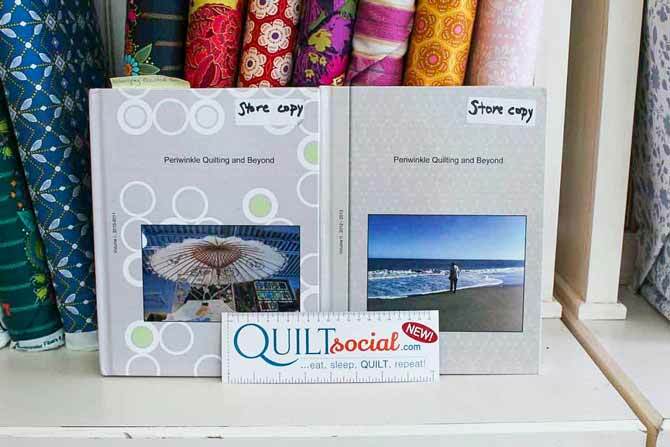 Wouldn’t it be fun to have all 50 ways to keep a quilter happy while on vacation in a book. What do you think? In the classroom, I found this gorgeous wall that was created from shade cards provided by fabric manufacturers. What a great idea! The other thing that really caught my eye were some of the displays in the store. I think I’m going to have to add a new section to my thrift store visits – picture frames. That wraps up 50 ways to keep a quilter happy while on vacation. That’s the bad news – the good news is that many of the ideas can be done throughout the year. I hope you enjoyed the posts and hopefully you were able to get a couple of them in and perhaps check out a new quilt store or two. Let me know what quilty things you discovered this summer. 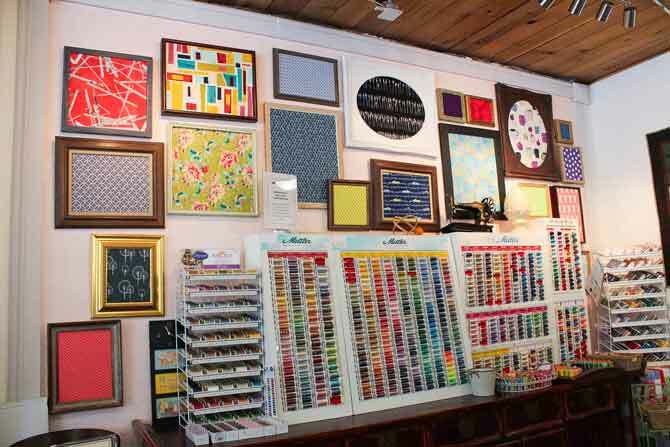 Click here to see all the articles in our “50 ways to keep a quilter happy while on vacation…” series! I think publishing your 50 ways is a great idea. I had the pleasure of experiencing a few of your 50 ways (before your blog) during a vacation in Ogunquit, Maine in 2012. Unbeknownst to me there was a quilt shop just a few minutes away from the condo we had rented. How convenient! I had brought my sewing machine, etc. along to work on the borders of a quilt I wanted to finish. I had bought many green fabrics to use in my outer border but none of them “spoke” to me. I found the perfect fabric in that nearby quilt shop. Also, to my surprise, there was a state wide Shop Hop during our stay. So we, like you, took the long scenic route home to hit as many shops as possible.